Story [8/10]: The plot of this show really had good potential. However, just having a good plot is not the only necessity, it needs good execution as well. A Princess of ancient lineage and guardians to help her protect a village (and, in a larger perspective, to protect the world) from falling apart due to evil forces - though this too is a cliched plot still there are lots of ways in which the story could have evolved. I dont say that the story went bad, but the way in which the events in the show were handled didn't feel satisfactory. Still, its not that bad that you will drop the show entirely. Art and Animation [8/10]: Anime art nowadays is really fluid, so no complaints regarding this section. Even the landscapes and background objects and such were beautifully drawn. Animation too is good enough. Enjoyment [6/10]: Well I didn't stop watching the show half-way. The story picked up some pace in the second half. Overall [7/10]: If you have some free time and really can't decide on what to watch, then probably you can give this show a try. This is for the girls mainly. I dont even know if the guys will consider this show a show looool. This is the second season of Hiiro no Kakera. I've written a review for the first one, so I thought to myself that I would review the second season! Story: 7/10 As far as the slow paced plot, the story is good, but it could have been set into one season only, instead of dragging it out. It took way too long for the Tamayori Princess go gain power to put away the Onikumaru. Art: 8/10 The setting, the characters are well made. There aren't really flaws in the art. Sound: 8/10 The OP for the second season is as good and soothing as the first one which I totally like. Character: You will still find Tamaki as useless as ever until the very end, but the others characters were well developed in this season second. Enjoyment: 9/10 I overall enjoyed the second season better than the first one, because it was more fast paced. The story was really developing and you could see the anime's potential. First, I'll begin with a story synopsis. If you already know it or don't want to see any potential, though unlikely, spoilers, you can scroll down a bit. The story, based on a series of Otome video games released in Japan, focuses on the characters, with multipe parallels illustrating many fundamentals of human nature. The story centers around an ancient family line of females known as the Tamayori Pirncesses. The main protagonist, named Tamaki Kasuga, is the youngest in that line who is coming of age as she arrives at her grandmother's estate and must learn what it is to be a Tamayori Princess. Tamayori Princess's purpose is to be the guardian and keeper of an ancient and mysterious power sealed within the land known as the Onikirimaru. The Princess has guardians who are sworn to protect here in the form of supernaturally powered males from a historic and loyal clan. The antagonists of the story belong to a group known as the Logos, a secret society bent on releasing the Onikirimaru, which is foretold to bring about the world's end. Tamaki, along with her guardians must stop the Logos before it's too late. I sit here pondering why Hiiro no Kakera is so effective at drawing the audience in , urging us to watch the next episode, and I realize a fundamental tactic employed by very few anime that shines through in Hiiro no Kakera. On the surface Hiiro no Kakera appears to be of stock value, with a dime a dozen written all over it. The art is well done, like most recent anime, the setting, and story, though interesting, are relatively basic in their presentation, and if you only watch 1 episode it is easy to see why many would dismiss the characters as well. Those who shrug off the first impressions and stick around for a bit, will find addiction setting in as you must watch the next episode culminating in a complete and satisfying resolution often lacking in many anime. This is accomplished by what I like to call incremental development. The characters, the story, the relationships, all are carefully developed as though you are watching a rose bloom before your very eyes without missing one beat. The characters and their relationships develop at a deliberately slower pace in order to emulate real relationships and personal growth and change. This forms a meaningful bond between the audience and the characters that continually grows stronger. This theme of development is consistent in the story as well as the producers purposely pull a few punches early on in order to end with a flurry and a satisfying bang. The music, voice acting, and sound direction are all superb. The opening song of the first season is one of my personal favorite opening songs in recent memory, not only for its aesthetics, but because of how well it thematically fits with the anime. The voice actors brings the characters to life in tremendous fashion, which is critical to any character based story. The acting is consistent and believable with strong outings from virtually every major character. On a side note, another contemporary anime that executes incremental development extremely well is Sword Art Online. Especially regarding the relationships of the protagonists. The actual story is much more interesting and complex than the synopsis suggests. The story has a couple of twists and turns and picks ups a bit towards the end of the series by providing some interesting and fitting revelations and some pretty cool events. The story, like the character development is well paced and always holds a mystery over the audience's head resulting in a curiosity that has the audience asking what will happen next? The ending is very satisfying and is personally my favorite part of the series. Although,some people may be put off by the slower pace of Hiiro no Kakera, as many other anime character and story developments happen literally overnight creating an air of impatience in the audience. But, true relationships are generally not created overnight and they have severe consequences for any actions taken. Personally it was refreshing and powerful to see a realistic take on character development that was in turn executed extremely well. The empathy I had for the characters felt real and I attribute this to Hiiro no Kakera's execution of incremental development. 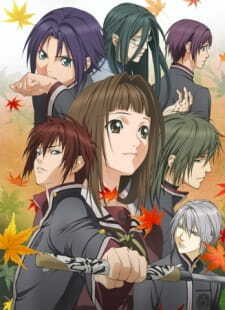 The tone of Hiiro no Kakera is of a somber nature with some light comedy peppered in throughout. But, for the most part it has its serious face on. It is dramatic and powerful when it needs to be and calm and quiet in mostly the right places. This sets up a pacing structure that is executed very well. It isn't perfect by any means but it is consistent and carefully accomplished. The action (aka beating people up), though sparse until the end, was well done and it fit well with the themes of the story. The protagonists are decidedly not overpowered and like many other anime characters struggle with the idea of power and a reason for fighting. (p.s. there is a neat battle at the end that rewards the audience for watching the entire series). Overall, from an academic and personal standpoint, I would rate Hiiro no Kakera a 9 out of 10. +Interesting story that picks up towards the end. Hello, thank's for reading my review. At least I hope you do, you haven't gone very far yet. Anyway, thank you! First of all, if you haven't seen season one, you should watch it first, things will make a lot more sense. It may be a tiny bit slow for some people, but please bear with it. Secondly, if you watched season one and aren't really sure if you should keep going, please do, it is totally worth it. The second season is so beautiful. They up the romance a whole lot, you will really love it. Okay, so now I'll tell you a little about the anime. It picks up right where the first season ended. The next day actually. They really turn it up a notch and it is a lot faster paced. They cover a lot more in the second season. The romance will really delight you and if you cry easily, you probably will. I certainly did. And in the end everything will make sense. After having finished this season I went back and rewatched season one, just to see if I had missed anything, and it turns out I had. I hope I was useful and you watch and enjoy the second season of Hiiro no Kakera! Hiiro No Kakera season 3 ?